Is your favorite room in the house your cozy kitchen? The Pine Wood Farmhouse Corner Hutch with Open Top is a country style cutie that saves space and offers stunning solid wood style. 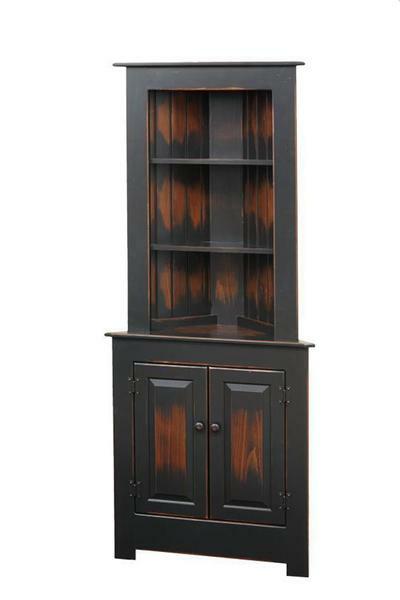 Helpful and handsome, this hutch has three open top shelves and a lower cabinet for storage and display. Gentle and warm, this pine hutch is beautifully handcrafted by the Amish in Pennsylvania. The Amish craftsmen there fashion hutches, bookcases, pie safes and other cased goods all from solid pine wood. Options for this corner hutch include a variety of stain, paint and distressing options, allowing you to create the corner hutch that fits your kitchen or dining room best. Pine furniture exudes the warmth that fits in perfectly with country, cottage and farmhouse styles. Pine is softer than other woods, but offers solid wood stability you can trust. Pine shows off distressing options beautifully, making it a prime candidate for an aged or antique look. Pine, with its even wood grain, also shines in a painted finish! The Pine Wood Farmhouse Corner Hutch is from our Quick Ship collection with a shorter build time so you can get it faster. At DutchCrafters we offer wood hutches in all different styles to suit your preference. From small to large, you can select the storage and style that fits your home best. Be sure to visit our Learning Center where you'll find our handy "How to Design Your New Hutch or Buffet In 7 Simple Steps," video. Custom hutches are our specialty. Please contact us for custom dimensions or features if you don't see them offered on our site. We thank you for shopping with us for your new hutch. Wall Width at base: 21 1/2"
Wall Width at top: 18"
Height from buffet to bottom of first shelf: 12"
Height from bottom shelf to middle: 10"
Height from middle shelf to top: 10"
Thanks for asking, and all your help. I feel like we're pen pals of some sort lol. We just received our corner hutches. To be honest we were nervous ordering something sight unseen. Yet we could not be more pleased. We absolutely love them. They are a perfect addition to our dining room. Thank you!